We meet again, Ben & Jerry’s “core” ice-cream. And this time, you’ve taken the confusing form of coconuts masked with caramel. I understood and mostly adored the That’s My Jam raspberry ruse back in 2014. Last year’s smooth operator, Spectacular Speculoos Cookie outfit was a bit too oddly spiced for my tastes. 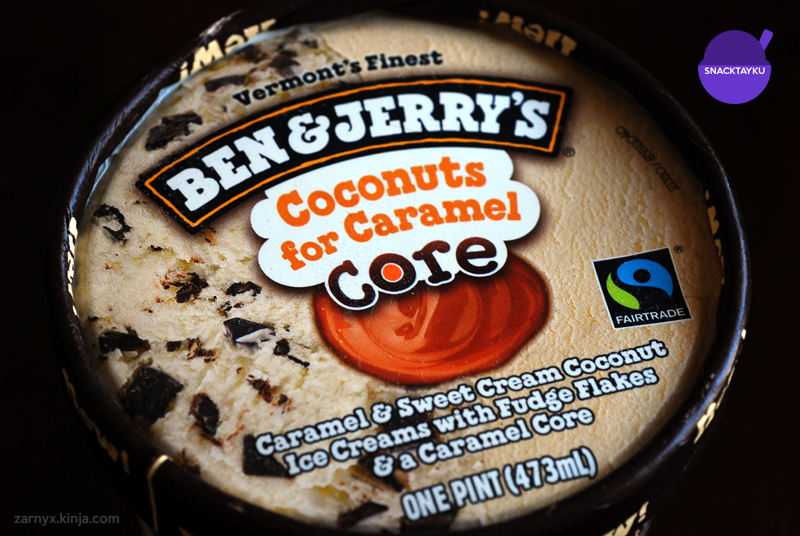 This year I’m even more torn than ever with Ben & Jerry’s new line of core ice-cream flavours, which include Coconuts for Caramel. So torn and confused, in fact, that I keep typing out a very bad word when trying to spell “coconuts”. You’d swear I didn’t grow up with coconuts for the better part of my life, having lived in Trinidad with a coconut tree in my backyard. It’s entirely possible I’m repressing some deep-seated childhood trauma, and Ben & Jerry’s is helping me along with some imposing but necessary therapy. Someone in my household doesn’t know how to evenly distribute ice-cream. More caramel for me, though. Not really complaining. Here’s the thing—I generally dislike chocolate chips or fudge flakes in my ice-cream (like a heathen, some may say). It’s one of the things that made me sad about That’s My Jam. Back then, I was grasping to figure out the obsession with chocolate-covered fruit. I still don’t approve of the practice. That aside, chocolate bits in Ice-cream usually come across as these foreign, hard objects that just don’t work for me. Yes, even in Mint chocolate chip ice-cream. Though I may not complain when a bit of chocolate shows up in a chocolate ice-cream because it just fits right in like an enhanced, overpowered chocolate experience. Using the sweet cream base for the coconut side of things in Coconuts for Caramel, Ben & Jerry’s tossed in those accursed fudge things again. Upon sight, I sighed. I was expecting tragedy. What I ate was not though, because they work here. And they only work here because the coconut bits also inhabit the sweet cream ice-cream, making an ice-cream Mounds candy bar along with the chocolate. Damn, I’d forgotten how much I like Mounds (and Almond Joy). The chocolate and coconut combination with the sweet cream just blends together for initial deliciousness of a pleasant combination. It really tastes like coconut ice-cream but a good kind without a cloying, fake coconut taste. The chocolate adds a balance that’s not overly sweet nor does it take away from the coconut flavour. It’s the perfect bite, until you have to keep on biting. This could work on its own but then that’d be ordinary ice-cream that could very well be offered by a different brand, which is not what Ben & Jerry’s is about. Across the way as the other half of the pint, caramel ice-cream beckons. In the middle is a core of pure, soft caramel. Together they’re also wonderful, creamy and sweet delights on their own, for fans of caramel goodness (I’m an advocate of a good sea salt caramel gelato or ice-cream). Added into the fray with its other half, makes me thinks Mounds should create a new candy bar line. And they’ll call it: Caramelized Mounds. Which sounds like a questionable thing to some minds. And a garbage heap of awesome to my ears. I also realize I’m not making sense to you, to me, or the confectioners’ marketing strategy team at Hershey’s… HERSHEY’s?! It’s now become a crime that I enjoy a Hershey made candy bar. Forgive me. Anyway, the caramel core and ice-cream, along with the other parts to Coconuts for Caramel make the name ring true. It’s a near-perfect bite of ice-cream flavours coming together in joyous crazed wants. Not too sweet, with nice caramel hints. Honestly, the name should be reversed because the coconut stands out most, but Caramel for Coconuts just isn’t as catchy. At the very least, I recognize why important decisions such as naming things isn’t usually left to me. Alas, my confusion about whether I really love Coconuts for Caramel, or like it well-enough, comes from the coconut itself. The first bite is always a party explosion to the senses. It’s fantastically well-played. And soon thereafter, it’s bliss interrupted by disappointment. It’s like being hit with terrible morning regrets, and hangovers which might mar an experience. Why? It’s not coconut flavouring in the sweet cream ice-cream. It’s coconut bits. And they’re chewy, as coconuts bits are wont to be. I apologize for this very graphic picture (and camera flash). I would say no coconuts were harmed in taking this picture, but I would be lying. I’ve got no problem with actual coconut. However, after 10 plus chews of coconut guts, long after the deliciousness of the ice-cream had faded into memory, I had a hard time enjoying the experience as a whole. The chewing exercise that results takes away from it. It sullies it, even! There’s too much waiting in between one bite to the next, and tempering that enjoyment makes me lose interest, as the rest of the ice-cream melts away. What sort of sacrilege is that!? I don’t even know. If you’re the kind of person who likes food that keeps on giving, by finding bits of it in your mouth by the time you’ve moved on to your next meal, then you won’t have a problem. I’m squarely in the camp of “no thank you”. Unless… hypothetically speaking, there’s a thoughtful piece of bacon to brighten your day in some such hypothetical scenario. Ben & Jerry’s Coconuts for Caramel is amazing on entry, with somewhat awful overall execution. All the flavours work wonders separate, and then even better together. It’s chocolate, coconut and caramel with sweetness that doesn’t overpower the coconut flavour, which is the true star. But then it happens: There are so many coconut bits that you’ll be chewing for a while, and that definitely starts feeling like a chore. Ice-cream as a chore! What a strange, mind-boggling feeling. I may need to go eat some more to sort out my life because ice-cream really shouldn’t be so complicated.